Campanula carpatica 'White' is a lovely white-flowered variety of this easily-grown campanula. 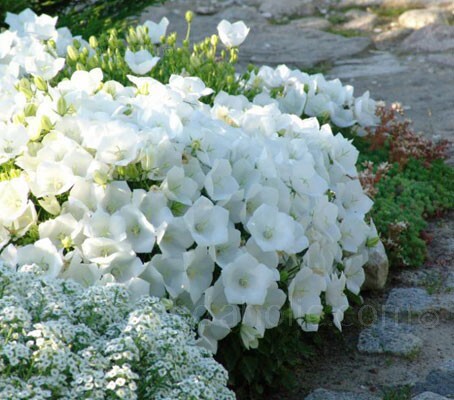 It covers its low mounds of foliage with upward-facing white bells for weeks in summer. The flowers are held on short stems above dainty heart shaped, bright green leaves. This dwarf, perennial campanula forms low-growing floriferous mounds that slowly spread to form an attractive ground cover. It is useful for rockeries, alpine troughs and containers and is robust enough to be used as path edging or planted at the front of a border. Excellent in containers, hanging baskets and window boxes it will bring pockets of freshness to the most sizzling summer day. Hardy to -34°C (-30°F), Campanula carpatica is semi-evergreen to evergreen in warm winter climates. They are sun lovers and are easily grown in ordinary free draining soil. Deadheading will promote additional flowering. The flowers are attractive to bees and can be used as cut flowers. With their ease of production and showy displays, no wonder Campanula carpatica has become very popular in today’s landscapes. With their ease of production and showy displays, no wonder Campanula carpatica has become very popular in today’s landscapes. In 1993 Campanula carpatica was awarded the Royal Horticultural Society’s Award of Garden Merit (AGM). Or sow in late spring (March to April) for flowering in July-August. The species can also be grown from seed directly sown outdoors in autumn or after the last frost. The seeds should be sown on the surface of the compost, press lightly into the compost but do not cover as they need light to germinate. The compost should be kept moist at all times. Cover the seed container with a piece of glass or clear plastic and leave in a temperature of around 16 to 18°C (60 to 65°F) in a position which receives diffused light. Germination between 14 and 28 days. Once some of the seeds have germinated air should be admitted gradually otherwise the seedlings may damp off. When seedlings have their first pair of true leaves and are large enough to handle, transplant into 7.5cm (3in) pots to grow on in a coldframe. When large enough, plant out into their final position plant out 30 to 38cm (12 to 15in) apart. Avoid planting out seedlings until all threat of frost has passed. 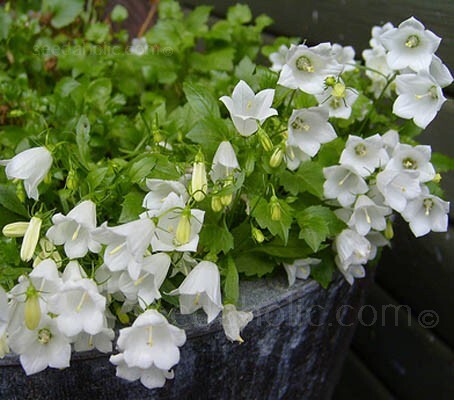 Propagate Carpathian bellflower by dividing the clumps in spring or early summer. Rock gardens, border fronts, path edging, Hanging baskets, window boxes, pots and containers. The species name carpatica derives from Medieval Latin or Old Italian carpita the meaning has shifted over time. In the 13th century it originally meant a 'thick woolen cloth'. By mid-14c. it referred to a "tablecloth or bedspread;". By the 15c it meant floor coverings. The Old French carpite meaning "heavy decorated floor cloth', that we now would call carpets. It refers to the way the plant carpets the ground. The common name Carpathian bellflower or Carpathian harebell is derived from their native origin, the Carpathian Mountains of Eastern Europe.